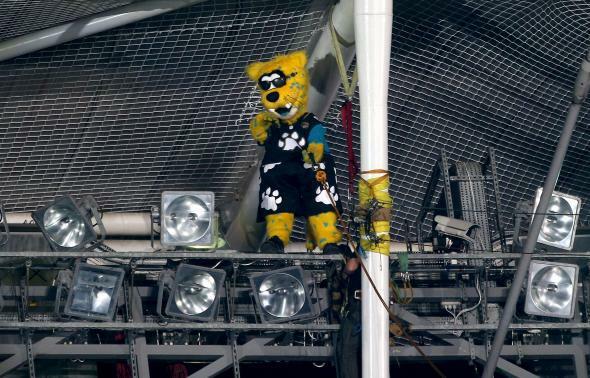 Jacksonville Jaguars apologize for mascot’s Ebola sign during NFL game. In case you were out apple picking and not sitting in front of the TV on Sunday, you missed this little tribute to bad decision-making, courtesy of the Jacksonville Jaguars’ mascot. The handwritten sign was a jab at the Jaguars’ opponent Sunday, the Pittsburgh Steelers, whose fans wave “Terrible Towels” in support of the team. It didn’t take long for the Jaguars to turn on their mascot, named Jaxson de Ville, for making light of the deadly virus that has killed thousands in West Africa and recently has made its way to Dallas. “The team was unaware of this inappropriate sign, which was hand-made by Jaxson during the fourth quarter of yesterday’s game, until after it had been displayed. We are handling the matter internally and taking it very seriously. We extend our sincerest apologies to anyone who was offended,” Jaguars president Mark Lamping said.